Ladies and gentlemen welcome to the Playful Math Education Blog Carnival featuring the incredible number 127 of the famous Mersenne Prime family! Let’s give a big hand to. . . . .
39-digit 2¹²⁷-1, the smallest quadruple Mersenne Prime! It took NINETEEN YEARS (1857 to 1876) for Édouard Lucas to test Mersenne Prime Number 2¹²⁷-1 BY HAND to successfully verify that it is indeed a prime number. It is the largest Mersenne Prime that has ever been verified by hand calculations! In this month’s blog carnival posts, the amazing Desmos will delight and astound young and old alike. There will even be an Easter egg hunt! The blog posts are joined by several posts from Twitter. Stay as long as you like and ENJOY what the many carnival participates have to offer in 20 different amusement areas! Stephanie showed off her colorful and impressive Tessellation Math Art Wall on twitter. David Petro used all 84 pieces of a 21st-century pattern block set to create a lovely symmetrical design. After this year’s very long winter, I’m especially glad Colleen Young collected some lovely and amazing springtime Desmos drawings and gifs in It’s Springtime. . . .
Do you see mathematics everywhere? Continuous-Everywhere-but-Differentiable-Nowhere can and does, even on a student’s shirt. Read the story and see the t-shirt design replication in Desmos in Going Off the Beaten Path. Wanting to have your students create an art project in Desmos? 1ntegration-by-Parts has given that assignment many times and has links for student directions to help them meet your expectations in Desmos Art Project (Update). You must click on the turtle face link in Desmos Art! With just ONE equation, a magnificently detailed turtle face was produced in the Desmos calculator. I was so impressed. I tweaked that single equation by changing the number 16 to 7.29, added some color restrictions as well as equations to make a mouth and some eyes to produce my own Desmos Art piece I call Blue-eyed Beauty. Elementary-school-age students will enjoy Desmos’s Polygraph activity given to second graders that Matt Vaudrey shared. I-Speak-Math has a mathematics homework solution students LOVE. Read about it in Meaningful Homework and CPM. Jennifer Michaelailis has a pro tip on how to keep students who need a little extra help in class from feeling defeated. If you want a free math education gathering in your area, here’s how to get one started. Also, check out Denise Gaskins’s resources to keep the group going. Many people have a personal story to tell that explains why they love mathematics. Through a Mathematician’s Eyes opens up and shares her experiences in My Story. What obstacles did she face? How did she feel about enjoying a subject so many others hated? Philip Jose Pacis played with some math vocabulary and wrote a poem he titled Fractions about a fractured relationship. Calendars and time are mathematical topics. How many other mathematical terms do you see in Maggie C.’s poem On Time? Do any of those words have more than one meaning? Math Geek Mama has come up with Decimals on a Number Line Game and includes everything you need to teach this concept with complete confidence. Would you like to play Decimal Pickle? On Twitter, Mrs. Unger explained how to play it as well as a few of its variations. There’s no need to call the paramedics when it’s time to learn about parametric functions. Suzanne Van Oy has come to the rescue! She sees a lot of value in parametric functions and their graphs. Why is she so excited about them? What’s all the fuss? Suzanne answers those questions and more in Why Parametrics?. Suzanne Van Oy also recently put an incredible spinning Desmos Birthday Cake on twitter. How does she make Desmos gifs that don’t look like they need to be put on life support? Six months ago she blogged about how to do it in Making a Great Desmos Gif. She certainly knows what she’s doing! Sometimes Desmos doesn’t do what you expect. Your work might need some first aid. DesmosGraph (Unofficial)’s post: Desmos Traps: Why Is It Not Working may have the diagnosis and cure you seek. Although this post from Gold & Ratios is two years old, I still wanted it included on this list. It teaches how to add color and texture to Desmos. Cliff Pickover shared Don M. Jacobs equation for an egg laying on its side. Tamás Görbe shared an equation for an egg that is standing up on its wide end. Get out your markers and start coloring Paula Beardell Krieg’s graphic of an egg and Three eggs! Paula also shows how she colored one of her eggs. Mathigon shared a gif of a colorful, nine-piece, tangram-like egg puzzle that can also transform into a rabbit and a goose. Robert Bosch shared a TSP art depiction of an egg and a chick that have a few mathematical traits in common. Christopher Danielson posted a question on Twitter that generated a lot of thinking from adults. I’m sure it would do the same for kids who understand a little bit about exponents. Jongarland6 was able to get ELL students conversing with each other in English about exponential functions. How it was done is described in Desmos Sparking Academic Conversations. Math Play Day gives ideas from 20SomethingKids and 1KookyTeacher about playful ways first-grade kids learned about fractions. Mathgeek Mama published some adorable free Equivalent Fraction Robot Puzzles. A recently released YouTube video has a little girl teaching about fractions in Maths 4 Kids’ Fractions of Shapes and Fraction Vocabulary. Every carnival has food concessions. You can have a lesson at breakfast on fractions based on CTSPEDMATHDUDE’s post Sausage Fractions: Real Life Example. When teaching fraction division, should you start with rules or diagrams? Filling the Pail speaks from experience in Fraction Division and explains the advantages and disadvantages of both approaches. On the spur of the moment, I came up with a very quick Yahtzee variation that I played with one of my students. We counted the number of rolls it took us to get a Yahtzee. Lowest score wins. He beat me badly every round as the graphic above this category attests, but on a different day, Lady Luck was with me more than him. Denise Gaskin also has a tried and true Yahtzee game variation that she calls Six Hundred. You only need to print her directions and scoring sheets, provide six 6-sided die and pen or pencils, and you’ll be ready to make memories in more ways than one. The Mathematical Tourist shared how to play a game called Clobber. The game has been around since 2001, but the best strategy to win the game is still a mystery. I’m sure getting clobbered will be just as much fun as winning. What did an insightful five-year-old tell Paula Beardell Kreig about triangles? Simon Gregg showed some pictures demonstrating how students had fun exploring squares in several different ways. Similar geometric shapes line up and beg you to compare their dilations in Paula Beardell Krieg’s post About Halfway There. Robert Loves Pi creates wonderful 3-D rotating digital geometric models. This one he calls the Twelfth Stellation of the Triakis Tetrahedron. Desmos is a great tool, but sometimes I need to actually see how people use it to teach. Bearsemath.com does exactly that by sharing some pictures of Desmos Geometry being presented to a class of 10th graders. When Women Inspire gives Three Worthy Reasons to Teach Charity to Your Kids. One of those reasons is that they will naturally learn the mathematics of money management. Read the impressive CBS News account of how a STEM Robotics team made a toddler wheelchair for a two-year-old whose family couldn’t afford one. LMS Life Skills was practically speechless! Her class designed quilts blocks by using linear equations. Then the class made two quilts and donated them! Wheeler’s Thoughts on Teaching used a bank balance problem to teach about solving a system of linear equations. The students were able to think about the problem and work on it with much fewer hints from their teacher. That makes teaching math much more fun for the students as well as the teacher. Jeff Lay created an Easter egg hunt activity to review linear equations, and he is happy to share the google docs he made with you. Ms. Wheeler exclaimed that sometimes crayons and paper do the trick while her glass created stain class art. Coincidentally, Ian Maclellan also had his class produce some stain glass art with linear equations. Alicia Phillips shared one of her student’s projects that used only linear equations and was made on Desmos. Imagine this carnival ride: a catapult that will send you flying through the air! Lana Pavlova and Meredith Wilkes have assisted Math Book Magic in creating the perfect design of an unforgettable carnival ride in Play with Your Math with Little Pea. How far will this catapult take you? Erikson Institute writes how Anno’s Flea Market by Mitsumasa Anno, Which Would You Rather Be? By Willaim Steig, and Whose Shoes? By Stephen R. Swinburne are Three Books That Encourage Simple Graph Explorations with Young Ones. Life Through a Mathematicians Eyes loves to curl up with a good book that features mathematics. Find out which books she has gathered and plans to read in her MathReadathon. Kelly Anne Garner received several must-have mathematics in literature book suggestions from Twitter to build a fabulous math library. Check out the whole thread. Chirag Mittal took charge of April’s birthday celebration of Leonard Euler. Did you know that Euler is credited with being the first to use letters from our alphabet and the Greek’s alphabet to represent some very important functions and numbers: Σ, f(x), e, i, and π? Alan Paar of Established 1962 has put together a tour of Wendover School and the way teachers taught and students there learned several mathematical topics and other subjects from 1868 to 1930. Jo Morgan retweeted a tweet that caught my eye and was, therefore, the catalyst for bringing MathigonOrg’s expansive and interactiveTimeline of Mathematics to this month’s carnival. The number 127 is a centered hexagonal number as demonstrated by the graphic above. Ramblings of a Writer recently marveled about how many things come in fours in her post Exploring the Number Four. Dr. Helen J. Williams has pictures from a very playful session on “Fiveness”. Science Switch had a few things to write about Belphegor’s Prime number, 1000000000000066600000000000001, in The Most Evil Number. When there was a day off from school in the middle of the week, BMore Energy found plenty of kid’s activities in Manhattan’s Museum of Illusions. Love Travelling takes us on a trip to see the fun-filled Vilnius Museum of Illusions. There is so much to see there! While Matematickcom shows how to make a paper optical illusion that you can make yourself in very little time. 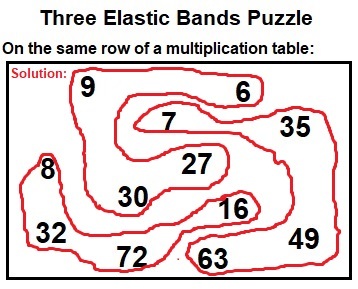 Math with P. Nik gives instructions and several examples of his Three Elastic Bands puzzles. He said they were easy to make, so I made the one at the top of this category. Follow P. Nik’s instructions and you probably won’t need to click on the tiny answer key under the puzzle. When Simona Prilogan of Fiat Lux writes a number puzzle, it is much more than it appears. You have to study patterns inside the puzzles to figure out what the relationship really is. Give her Wednesday Math Puzzle a try! Simona included a bonus, information about Bolsover Castle, in her Monday Math Puzzle. You will find two different Math Puzzles in the middle of reading about the Castle! This clever tie matching exercise from Math with P. Nik feels more like a puzzle than a worksheet. Can you match the graph families with the correct equation families? Yes, you can do statistics in Desmos! You can make Normal, Poisson and Binomial distributions and even graph box and whisker plots in Desmos! Colleen Young shows you what that looks like in her post Statistics with Desmos. Does El Niño play much of a part in rising global temperatures? In New Kid in Town, Open Mind answers that question and includes line graphs to help us visualize global temperature data collected since 1979. This year Easter occurred on April 21st. That seemed rather late to me, but it isn’t the lastest it could be. In Joseph Nebus’s post, What Dates Are Most Likely for Easter?, he’ll direct you to a post he wrote two years ago where all the data is lined up to figure out the probability. What time is it? There is more than one valid way to give the correct time, and one way should not be labeled as a smarter way to give the time than the others. That’s the message given in Dan Meyer’s Don’t Teach Math “the Smart Way”. He even suggests a lovely game from Desmos to get kids talking about telling time. After a long winter with snow causing several school days to be replaced with “e-learning days,” Educational Technology in Action wrote about using that same Desmos talking time activity in Desmos for meaningful e-learning days. On Twitter, Jo Morgan shared a photo that truly enhanced the 1679 definition of a Rhombus. Joseph Nebus of NebusResearch regularly writes about mathematics-themed comics. Here is a comic about the difference in definitions of vertex and apex. It also has a graph theory puzzle and three other comics about story problems involving addition and subtraction, slope intercept form, and paradoxes. What does the word Asymptotic mean? Hazel Clementine shared a catchy musical definition. Thanks for coming to this month’s carnival! I hope you enjoyed it. I had a wonderful time hunting for goodies to put in the carnival and organizing it. I felt like I was on an Easter egg hunt looking for the best eggs! So far, no one has volunteered to host May’s carnival. Perhaps YOU will consider contacting Denise Gaskins and volunteering! There are also two open dates in the summer still available this year. You can also visit The 126th Playful Math Education Blog carnival hosted by Math Mama Writes. . . or the 157th Carnival of Mathematics hosted by Lines Curves Spirals for more mathematical adventures! During my lunch, I put one of the graphs, its inverse, and some of their translations on Desmos and made a simple but lovely piece of art in the process. Before I was done, I showed it to a couple of students. One of them asked, “Are you saying that math can create art?” I loved replying, “Yes, it can!” Now that student wants to create some works of art, too. It was a privilege to show her how to use Desmos. The exponents inthe prime factorization are 1, 2, and 1. Adding one to each and multiplying weget (1 + 1)(2 + 1)(1 + 1) = 2 × 3 × 2 = 12. Therefore 1314has exactly 12 factors.